“The law is catching up with what the public is saying with the use of firm names,” James J. Sabella, Esq., said during a fast?paced panel session at the Baruch/CPT conference, moderated by Baruch Professor Douglas Carmichael. “If you are going to say to investors that you are one firm worldwide – it is hard to say when something goes wrong, ‘Only kidding!’ You have to actively exercise the control that you have, rather than let the local partners run amok,” Mr. Sabella stated. His firm, Grant & Eisenhofer, had represented plaintiffs in the Parmalat case against Deloitte that ended in a settlement. The attorneys were critical of the Treasury Department’s Advisory Committee on the Auditing Profession’s failure to make any recommendations about the concentration of auditing of public companies within four firms worldwide. Mr. Peterson said, “The profession is down to critical mass. The destruction of one of those firms would take down the whole system.” He did not think the U.S. Congress would take on this problem at this time. “The business model of the firms does not work and no one is talking about alternatives,” he stated. The NASBA/AICPA Uniform Accountancy Act Committee met on November 18, 2009 in Chicago to begin their discussion of firm names as mentioned in the UAA and the Model Rules. 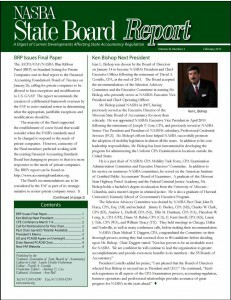 The white paper released by the AICPA/NASBA study group in August served as the starting point for the meeting’s agenda.